NEW YORK (Reuters) – Accused hedge fund billionaire Raj Rajaratnam and his family's foundation were sued in a U.S. court on Thursday over allegations that they provided $5 million to Tamil Tigers militants in his native Sri Lanka's civil war. The lawsuit in U.S. District Court in New Jersey on behalf of 30 people who were victims or survivors of attacks by the Liberation Tigers of Tamil Eelam in the South Asian country's civil war said the money assisted "crimes against humanity." 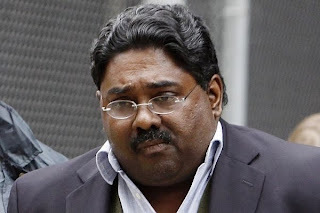 Last Friday, Rajaratnam and five others were criminally charged by U.S. prosecutors and the FBI in New York in what they described as the biggest hedge fund insider trading case ever.